Carlsen has won Shamkir Chess four times in four attempts. | Photo: Shamkir Chess. With one round to go, Magnus Carlsen has already won the Gashimov Memorial in Shamkir, Azerbaijan. In another excellent attacking game, the world champion defeated his main rival, Sergey Karjakin, with Black. Karjakin, half a point behind, went for his last chance today. He needed to win, took risks, but faltered in the end. Karjakin decided not to attend the press conference. Not winning was one thing, but not holding the draw as White must have been especially disappointing. Carlsen's solo session lasted 26 minutes as he was asked many questions as the tournament winner, and this resulted in quite a few good quotes. But first, the game. Carlsen gave a long and interesting press conference today. | Photo: Shamkir Chess. "People keep playing 7.Nd5 against me and I am alway happy to see it because it leads to interesting chess," said Carlsen. "I think he was a bit surprised by my choice [8...Ne7 & 11...Bf5 - PD] since I hadn't gone for this particular line since my 12th game in the match against Caruana." This specific way of playing invites White to an early move repetition. Carlsen: "Obviously with the tournament situation I didn't mind a draw." Another meeting between the 2016 world championship match participants. | Photo: Shamkir Chess. Just like in his game with Caruana, his game with Jorden van Foreest in Wijk aan Zee and his game with Anish Giri yesterday, Carlsen then sacrificed a pawn for active counterplay. Initially, the position was still balanced until Karjakin erred, thinking that the game was going to end in a draw. "I think 26.Nc3 was just a mistake and that he just underestimated my plan," said Carlsen, who continued with a few powerful moves to get a devastating attack on the light squares. Two very good games in a row brought Carlsen tournament victory. | Photo: Shamkir Chess. Today's game, I don't know if it was very good but it was very interesting. Yesterday was very interesting as well. I was a little bit upset that I didn't manage to finish it off in the right way. Certainly the last two game have been fun; that I've been to play in interesting, dynamic attacking style. It's not the way I usually win games. It's been a lot of fun frankly the last two days, it's been a great ride. I think when looking at the game with the computer it's hard to understand what's actually going on in the minds of the players. When I look at chess I try to look at it as little as possible with the computer, because I know that once we get past the preparation phase then it's not really relevant what the computer says, it's more about psychology and everything. This particular opening is a typical case. If you turn on the computer early on it will say that White is better but it will not say whether the position is easier to play for White or Black, and again once he got out of the opening then it feels like he's a pawn up but it feels like the stakes are higher for him. I am going for mate and he has to survive. I think psychology is definitely a huge part of the game. "I think psychology is definitely a huge part of the game." | Photo: Shamkir Chess. Carlsen has now won in Shamkir four times in four attempts. The impression is that during the last few rounds, he has been showing the chess from his best days. Or, as he put it himself in one of the match press conferences in November: the chess as was played by his favorite player, himself, three or four years ago. Robert Hess tweeted today: "At the 2018 World Championship when Magnus Carlsen answered the question about his favorite player, is he sure he didn’t mean "myself...maybe 4-5 months from now" instead of years ago?! He’s been absolutely brilliant in 2019!" 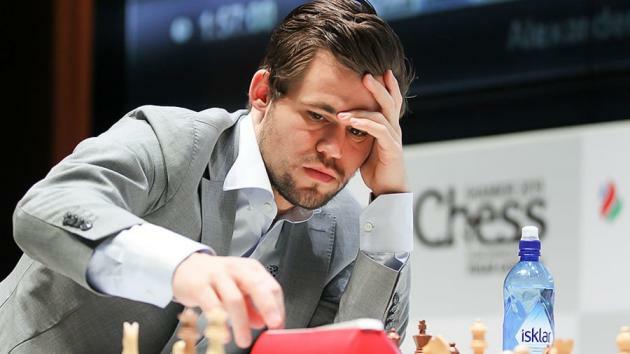 "I think there's certainly a difference in style," said Carlsen. "I definitely play differently now than I did then. I know a lot more about chess than I did five years ago. I was higher-rated then so the evidence doesn't suggest that I'm a better player now but I feel like I know more and I can do more and I have sort of more options to use, a wider array of weapons than I did back then." Carlsen says he now has "a wider array of weapons." | Photo: Shamkir Chess. The other winner of the day was Alexander Grischuk, who didn't get an advantage against David Navara's Caro-Kann until the latter put his knight on h6. "Unnatural," according to Grischuk. Navara's follow-up with 15...f6 was a continuation in the wrong direction. "A very ambitious move, but I don't think it works," said Grischuk. "I am getting tired towards the end of the tournament and I started miscalculating here," said Navara. Navara and Grischuk going through their game. | Photo: Shamkir Chess. The game between Giri and Shakhriyar Mamedyarov was one between two groggy players who are both looking forward to finish their tournament. "I played very fast and very bad," admitted Mamedyarov, whereas Giri just failed to make the most out of a promising opening position. Both not in the best shape ever: Giri and Mamedyarov. | Photo: Shamkir Chess. A long fight was Veselin Topalov vs Ding Liren, and for most of the time it seemed quite certain that it was going to end in a draw. The Chinese GM kept on pushing, even when the theoretically drawn N-vs-R endgame appeared on the board. It seems that at some point fatigue started to play a role. First, Topalov erroneously claimed a threefold repetition after Black's 86th move (it was only the second time this position appeared). Then both he and his opponent made suboptimal moves according to the tablebase, with Topalov making the last mistake and actually losing this endgame, which is harder than it seems! Topalov vs Ding lasted hours. | Photo: Shamkir Chess. The draw between Teimour Radjabov and Vishy Anand was brief and not too exciting, as a result of accurate play by Anand in a 5.Bf4 QGD that was just slightly better for White. "It’s like always in the Queen’s Gambit; it’s not so easy to get anything," said Radjabov. Radjabov vs Anand, the eighth draw for Azerbaijani GM. | Photo: Shamkir Chess.